More than two decades ago, doctors could do nothing for Walfre Lopez as his vision faded away due to a degenerative eye disease. Now, a revolutionary artificial-vision procedure done at University of Florida Health has given Lopez a new window to the world. Early this year, Lopez got what he calls a “bionic eye” — a microelectrode array implanted in the retina. The electrode takes over the function of damaged retinal cells, sending signals to a special pair of glasses that allows Lopez to see shapes and contrasting images. Lopez is the first patient to receive the Argus II Retinal Prosthesis System at UF Health, one of 18 implant sites in the United States. Gibran Khurshid, M.D., is the first retina surgeon at UF Health to have expertise in this area. Lopez, 46, was in his early 20s when he lost his sight to retinitis pigmentosa, a genetic disorder that destroys light-sensitive cells in the back of the eye. It affects about one in 4,000 people in the United States and worldwide, according to the National Institutes of Health’s National Eye Institute. At the time, his son Bryan was just 2 years old. Twelve years ago, his daughter Brianna was born. Lopez had never seen her. That all changed in late February, when Lopez and his family returned home to Dalton, Georgia, after his “bionic eye” had been activated. Brianna asked her father to give it a try. The device works this way: A miniature camera mounted in the glasses captures images that are sent to a small video processing unit worn by the patient. The processed signal goes back to the glasses and is transmitted wirelessly to an antenna in the retinal implant. An electrode array then produces small bursts of electricity that stimulate the remaining retinal cells. Visual information travels along the optic nerve to the brain, which creates the perception of light patterns for the patient. As an artificial-vision system, it’s not an exact replacement for natural sight — users can recognize shapes and perceive the contrast between light and dark objects. Still, its effects are life-changing in big and small ways. For Lopez, it has made his home more accessible. “When I’m walking around the living room, I know exactly where the windows and doors are located. I couldn’t do that before,” he said. 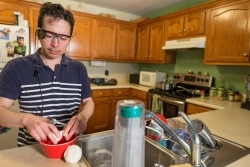 The retinal implant has also allowed Lopez to rekindle his interest in cooking. In the kitchen, the Argus II system helps him find cooking items in cabinets and use the stove. At the sink, white cups and dishes are easily recognizable. “I like to cook, and now when I’m in front of the stove I can see the pan. That just wasn’t possible before,” Lopez said. The device has been a blessing for the whole family. Marioly Lopez will never forget the days when her husband’s sight was fading and he was battling sadness, anger and a host of other emotions. The first two years of his blindness were especially difficult, but the retinal implant has delivered more than just a sense of vision. The Argus II system takes advantage of a patient’s remaining cells to create some stimulation within the retina, said Khurshid, a clinical faculty member in the UF College of Medicine’s department of ophthalmology. He implanted a tiny microelectrode array in Lopez’s right eye during a highly complex surgery in mid-January. The electrode array takes over the function of diseased cells in the eye and transmits signals to a camera in the patient’s glasses. The result: Once-blind people have a 20-degree field of vision. “It’s not full vision as we know it. It’s almost like having a sixth sense, and then you have to train the patient how to use it,” Khurshid said. Activating Lopez’s retinal implant system during the February appointment in Gainesville and seeing his family smiling was a moment of utmost satisfaction, joy and accomplishment, Khurshid said. A day before the activation, Khurshid wanted a sense of what Lopez had endured, so the physician put on a blindfold. Five minutes of darkness was all he could tolerate. Ana Leffel, vision rehabilitation manager for Second Sight Medical Products, said patients have to spend time getting accustomed to the device. For Lopez, that meant using the device for 30 minutes and taking a two-hour break. Patients can eventually use the device for four to six hours a day, he said. UF Health is one of 18 sites nationwide authorized by the federal government to provide retinal stimulation treatments to patients with severe retinitis pigmentosa who have little or no light perception in both eyes. For the Lopez family, the device has already brought some unforgettable moments. “The first thing I noticed is that he could see the shape of my face and it made him smile,” Brianna said. His family’s love and support never wavered, and Lopez never gave up hope that something spectacular might happen one day.